When Emmet’s uncle, Captain Francis Drake, arrives at the door of his cottage Emmett doesn’t know what to think. Orphaned when he was small Emmet has had a quiet life living with a monk up until now but now the old man is dead and Emmet is alone in the world. So, without much enthusiasm Emmet leaves the only life he has ever known to join the crew on his uncle’s ship. Emmet is to be his uncle’s valet and general dogsbody. Emmet isn’t on board for long before he comes to realize that he is going to be living amongst a rough, dangerous, and often cruel group of men. There is friction between Captain Drake and the other officers and as the journey gets longer and longer the men begin to complain and to wonder where they are all going. Watching his back at all times and trusting no one, Emmet tries to come to terms with who and what he is. Is he just a coward? Is he really a murderer? Will he ever find peace? This incredibly powerful and often disturbing book is packed with adventure and thought-provoking characterization. 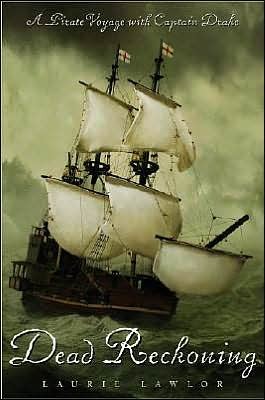 Readers will come to see that Captain Drake was indeed a pirate in every sense of the word and that the world that he lived in was harsh, cruel, and dangerous. We can pity Emmet, wish him well, and hope that he is able to summon up the courage to be true to himself.